Bash is a language that allows for easy manipulation of Unix-like computing environments. Frequently in NLP research, quick simple tasks like “how many lines are there in this file” or “how can I copy a file to 100 places at the same time” arise, and can best be solved with bash, and some easily-usable affiliate programs. Beyond this, Bash is much more versatile and useful than many give it credit for, and advanced knowledge of bash can make projects involving very large systems and/or multi-step pipelines truly a joy. I love bash dearly. That’s not to say it’s the answer to every problem in NLP. You need to set up folder structures, create symbolic links (more on this later), and generally change the file system. You want to set up a “pipeline”, which means a set of processing steps that takes input files and produces output files, using multiple independent programs. As we said in use bash when, we frequently use bash to manipulate a Unix file system. The unix filesystem is a rooted tree-like data structure. Its root is /. This forward slash is known as “root”. 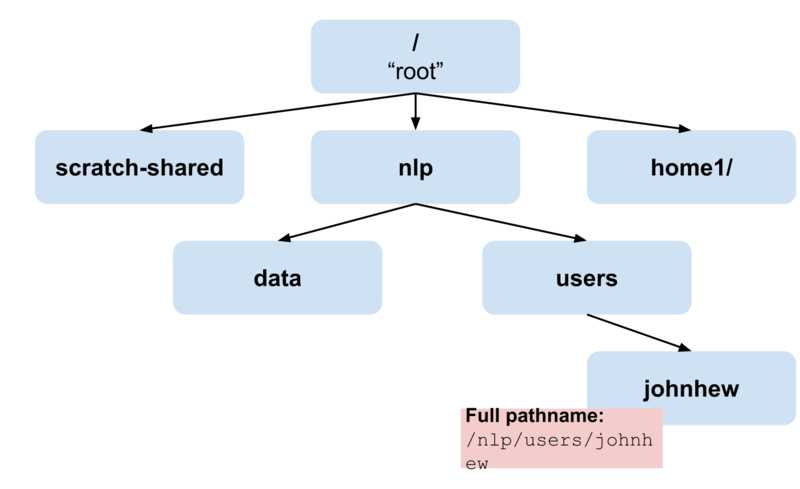 Below is a diagram showing a selection of the root of the nlpgrid filesystem(s). When using bash, you are always “at” one of the nodes in the filesystem tree. Every command you run is run relative to your current node, or “folder”, or more commonly, “directory.” A “path” is a list of names of folders combined with forward slashes (/) that takes you either from root (an absolute path) or from any arbitrary directory (a relative path) to some other directory. In both cases, the . was implicit. You should find that bash complains with a command-not-found error. This is because you told bash “look for the command touch; it’ll be in this directory.” Without the prepended ./, the command touch is found by other means, which we’ll find later. Where .. is short for “parent directory”. cd - sends you to the last directory you were in, whatever that was, and prints the name of that directory. ~ the tilde represents your “home” directory. On my laptop, for example, thats /home/johnhew. If you run a command with the tilde, it will be replaced by the location of your home diretory. tree is a fun commands that lists the tree structure starting from the current working directory and searching “down” (away from /). You’re copying loc1 through loc4 all into loc5. If loc5 is a directory and loc1,loc2,loc3,loc4 all have unique filenames, all 4 files will be copied into the loc5 directory. If loc5 is a file (or didn’t exist previously), each file will be copied sequentially into loc5, squashing all old files. In other words, all you’ll end up with at loc5 is (in this case) loc4. If you don’t want to keep the old file locations, use the mv (move) command instead of cp. Moving files is great, but actually working with files contents is great too. Here’s a good starter vimrc, which is a configuration file. Google for more info. This has just printed all of files 1,2,3 into the file fileall. The > character is called a “redirection”; it redirects the stdout stream to the file specified after it. This will print out lines in each file that have the string string. This will print the number of characters, number of words (whitespace-delimited) and number of lines in the file. cat file1 file2 file3 | sort | uniq | grep "error found"
grep -c will print the number of lines that matched, instead of the lines themselves. This is equivalent to piping through wc -l.
grep -r pattern dir will recursively grep through a given directory dir. wc -w will just give the word count, similarly wc -l will just give the line count. Working with files in bash can be much faster than using a GUI. These shortcuts will help you get up to speed. Typing out long paths and filenames is very tedious, and prone to error. Bash provides a solution to both of these problems in “tab completion”. As you type a file name, bash knows all the files in the directory you’ve specified so far, and knows which files you could be referring to, based on the prefix you’ve written so far. At any time as you’re writing a filename, if you press <tab>, bash will determine whether it can unambiguously fill in any portion of the rest of the filename. Now, type in vim fi and then hit <tab>. Notice that bash completes to vim file without any work. Because these were the only files in the directory, bash knew that when you wrote fi, you meant either file1 or file2. It won’t complete further than that because it can’t be sure which of the two you mean. So, you have to fill in the rest of the file name. Even here, the forward slashes / aren’t typed by me, since the tab completion includes them, saving a lot of work. Typing out long lists of commands over and over again is a pain. Thankfully, bash includes a finite history of commands, and a nice search interface. First, as you might figure out accidentally, pressing the up arrow key returns you to the last command you ran. This is very helpful, but scrolling through tons of commands to find something you ran yesterday can be tedious. This is where the reverse-search comes in handy. It allows you to search for commands in your history that include a substring you specify. Type ctl-r in the terminal (hold ctl and press r), and you’ll notice your command prompt is replaced with (reverse-i-search). Now, type in a few letters that you remember were a part of the command, and it’ll search through your history to find the first command that matches your query. For example, I might look for the last time I qsub‘d something to the scheduler with ctl-r followed by qsub. If the first matching command isn’t what you’re looking for and you want to keep looking back through more matching commands, hit ctl-r subsequent times to move back through them. If you keep hitting ctl-r and the command you see doesn’t change, or if you type in a prefix and you don’t see a matching command appear, it means you don’t have any (more) commands that match your query. If you want to keep the command you found with reverse search, I tend to use the escape key. Ify ou want to discard the command you found with reverse search, I tend to use ctl-c. Many “move my cursor to another position” tips are, unfortunately, operating system- (or desktop environment-) dependent. For example on linux with i3, I use ctl+left\_arrow or ctl+right\_arrow to move one word to the left or right in the commands I’m typing. ctl+k erases everything from your cursor to the end of the line. ctl+a jumps your cursor to the start of the line. ctl+e jumps your cursor to the end of the line. ctl+w deletes a word to the left of your cursor. Note that you’ll have to get a feel for what a “word” means to bash. For example, whitespace separates words. Hyphens (-) do not separate words, and neither to underscores (_). This one is dangerous; proceed with caution. !string runs the last command that starts with `string again. !$ runs the last word of the previous command. If you find files with the extension .tgz .tar.bz2, .tar.gz, never fear. These are your friends in the unix environment.